I recently had a discussion with @johnderosa on Twitter about a good Pandora setup that doesn’t require keeping a browser tab open all the time. So I thought I’d whip up a quick explanation of my setup. 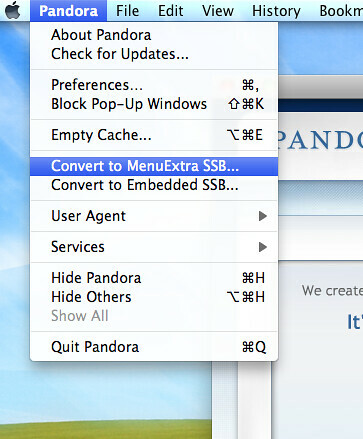 Now you’ve got a Pandora logo in your menu bar. 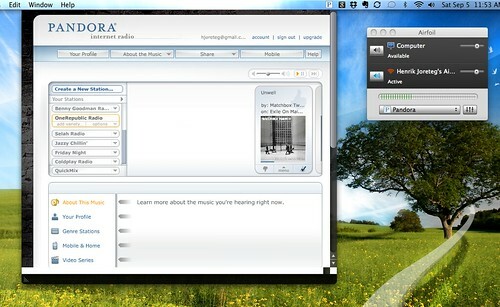 Your Pandora app now runs independent of any other browser on your system and you can access it anytime just by clicking the icon in your menu. How sweet it that! There’s lot of other great uses for Fluid. A few examples would be Gmail, Facebook, online developer docs, or any site that you access often can be really convenient to have as a separate app instead of having to hunt through your tabs to find it. Chrome for Windows already has the ability to create SSB’s, look for “Create Application Shortcut” in the page menu, it’s a greyed out menu item on the current Mac version, so it should be on the way for the Mac version too. 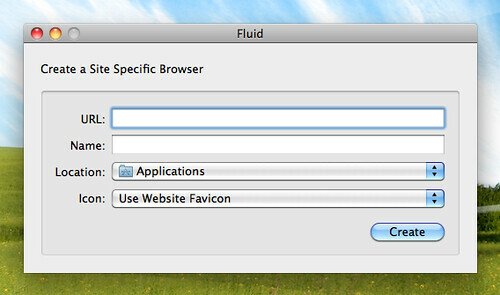 I think we’ll be seeing a lot more of this type of stuff in the next few years as the line between desktop and web apps continues to blur.